The latest buzzword in the global playing field of business is "Rightshoring". Offshoring, nearshoring and outsourcing have become things of the past, with rightshoring taking the pedestal among global organizations. Rightshoring is the restructuring of an organization's workforce to find the perfect mix of jobs that can be moved to foreign countries or be performed locally. Companies in the U.S and U.K have started adopting the principles of rightshoring in order to stay competitive. In rightshoring, a company outsources their simple and not-so-important processes to other countries, while retaining the complex processes in-house. The phenomenon of outsourcing simple processes and conducting the complex processes locally has been defined as "rightshoring". Organization feel that by handling the complex and important requirements of their business they can benefit from improved customer relationships and have a better control over their business. Rightshoring is all about maintaining a balance about the work that can be sent overseas and the work that can be best done within the organization. A few years back, global organizations started to outsource in order to reduce costs and thereby increase profits. Companies today are no longer looking only at the cost factor and want cost and quality services. In outsourcing, you might miss out on quality at times. However, rightshoring can help you in this matter. When your organization performs business-critical processes in-house, you can be sure of high-quality services. At the same time, your company can benefit from cost-effective services for simple and non-core business processes. This way, your company can get the best of both worlds, as you ensure quality for the services that really matters and get cost benefits for the other segments of your business. Every organization wants to experience increased efficiency and productivity. Rightshoring can enable your company to achieve both at the same time. Instead of burdening your workforce with all the work, you can outsource the non-critical work to outsourcing providers. This would leave your employees with more time to concentrate on your business and you can experience increased productivity. Your outsourcing partner might have expertise, experience and skill in business areas that are not part of your main business. 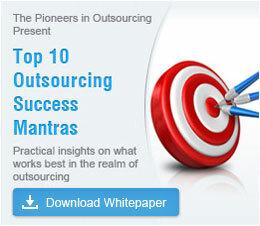 Rightshoring can help you tap this expertise from your outsourcing partner. The balancing of work that can be completed in-house and the work that can be outsourced can bring about overall proficiency and productivity. Customers play an important role in any business. With the increased offshoring of customer support services, customers feel dissatisfied when they do not get proper information or when they hear standard answers from offshore call center professionals. By adopting rightshoring, you could outsource your contact center services and at the same time ensure that you handle complex customer queries. This balancing of your customer support services can go a long way in ensuring good customer relationships. Since rightshoring involves a mixture of nearshoring, offshoring, twoshoring and multishoring, your organization can experience the benefits of these different types of outsourcing. You can nearshore the work that can be best done locally, you can multisource your work to the countries that have expertise in a particular field and you can offshore the processes that require proficiency and skill. With rightsourcing, your company can outsource manufacturing to China, Software Development to India, customer support to Philippines and perform marketing in-house. Rightshoring ensures that your organization gets the best out of outsourcing.